At tbe Montemonaco Chestnut Festival a few weeks ago I met Christian and his girl, Stella at his stand. Christian's family started a deli called "Antichi Sapori" in Comunanza (near Amandola) about 2 years ago. 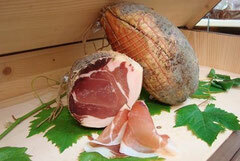 They sell cheeses, prosciutto, salamis, truffles and other gastronomic products. I bought some of their aged pecorino which was delicious so if their other products are of the same quality, Antichi Sapori is well worth a visit when you come to the Sibillini Mountains.